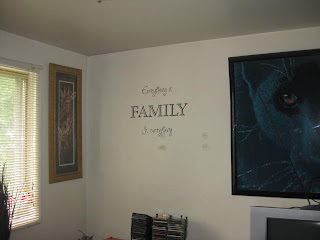 I recently had an opportunity to review Vinyl Wall Art from TheSimpleStencil.com. Talk about gorgeous stuff here! There's so many different categories too - from vinyl art for your bedroom, to a little girl's bedroom, even for the bar! 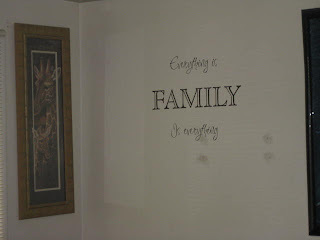 I chose one from their Family Room collection, Family is Everything, because I truly believe that Family IS everything. I had a hard time deciding where it would go because every wall in my living room has something on it, but I finally decided that I would put it where that one shelf was and had fallen and I have never hung it back up again. As you can see, my living room is full of wild animals - Giraffes, Black Panthers, and Tigers, we have them all here (that's only a sampling - you should see the rest!). 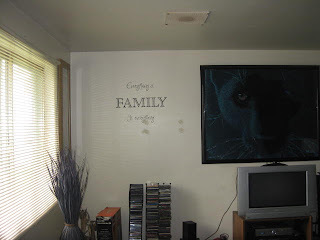 So I customized my Vinyl Wall Art in browns to compliment my decor. 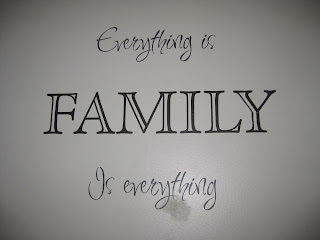 I love this Wall Art! The only problem I had was on the last one, the "Is everything" one - man that one gave me a fit! My arm is still sore from putting it up! But... I did just get done! ;-) The rest of them went on easy, peasy! All in all, these are great products! It's a gorgeous addition to my living room! The best part is, when I'm done with them, or I move, or I finally decide to hang up that shelf again, I can easily take them down and put them back up again! They're affordable too - the one I chose costs $25! A small price for a HUGE impact! 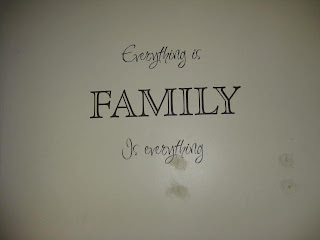 Thanks to Jennifer of The Simple Stencil for this review and to Shellie at Blog4Mom for hooking me up with Jennifer!